Death takes no holidays. We all know this but it would be too painful to acknowledge it during this season of supposed joy. Sometimes we are reminded of this undeniable truth on a grand scope, as happened during the Asian tsunami of 2004, which claimed an estimated 230,000 lives, and displaced millions. Its 4th anniversary was recollected on December 26 in homes and beaches from Indonesia to India. It is believed to be the deadliest tsunami in recorded history. More often death arrives on a more modest scale, although the tragedy is not in any way diminished by the numbers involved. Whether it be 1 or 100,000, the pain and anguish can be overwhelming for those forced to confront it. This is even more heart-rending in the case of children dying. While the rest of the world marked the joyous day of the Nativity in homes filled with the laughter of children, they passed the day at the dimly-lit mortuary of the church in Lubao town in the province of Pampanga, quietly keeping vigil over the lifeless body of their youngest child, Gian Carlo, who died from the rabies virus on the night of Dec. 23. He was five years old. Sometime in mid-December, mother and child were in a shopping mall looking for gifts. The little boy complained of having a headache. They went home, suspecting nothing worse than the onset of a mild flu. Then the intense itchiness came, radiating from the superficial dog scratch on Gian Carlo’s back, which had long healed, to his nape and head. The boy’s head began to swirl and throb as large beads of sweat formed on his handsome face. They rushed him to the nearest hospital, but the doctors could not recognize the early symptoms of rabies infection. The scratch from the neighbor’s rabid pet occurred in early October. The dog mysteriously vanished soon later. The wound quickly healed after a few days. Assured that it was not a bite but just a scratch, the boy’s parents did not immediately make the connection. Most Filipinos would not have suspected any link precisely because of inadequate public knowledge of the sources, symptoms and incidence of rabies in the country. People continue to die from rabies because it is easy to confuse its early flu-like symptoms with ordinary ailments. The subsequent appearance of its distinct symptoms–delirium, hyperactivity, furious agitation, hydrophobia, foaming around the mouth, and gradual paralysis–always signals the advanced stage of the infection. Nothing is more unimaginable as suffering, says the inconsolable Rex, than for a parent to watch a child slowly succumb to death from rabies. The victim struggles against the onset of respiratory arrest. Panic shows in his eyes. And you can do nothing. I believe him. Each time I watch my 8-year-old granddaughter Julia gasp for a little air when she’s having a simple asthmatic attack, I suspend my own breathing. Little children are not supposed to die. But they do die, at Christmas and other times. In a recent memorial service we attended for bereaved parents, whose children passed away at various ages and from many different causes, someone pointed out that even the first Christmas was attended by many such tragic deaths. Herod “the Great” was the ruler in Judea at the time of Christ’s birth. He was an unpopular king, being a Roman lackey, and he feared any threat to his power. He killed his wife, his brother and his sister’s two husbands, to name only a few who he perceived as plotting against him. And he took the news of this newborn king literally. When the wise men from the east, whom he had asked to report the whereabouts of the Christ Child, did not report back to Herod as they were warned by an angel to take another route, the murderous king decided to take drastic measures . “Herod, when he saw that he had been tricked by the wise men, was in a furious rage, and he sent and killed all the male children in Bethlehem and in all that region who were two years old or under, according to the time of which he had ascertained from the wise men” (Matthew 2:16). Little did Herod know that the new king and his parents had already escaped. Thus, the fulfillment of Jeremiah’s prophecy of the Old Testament in the New Testament: “A voice was heard in Ramah, wailing and loud lamentation, Rachel weeping for her children; she refused to be consoled, because they were no more” (Jeremiah 31:15). 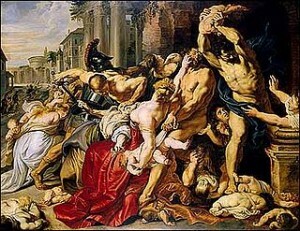 Which is why the Catholic Church celebrates today as the Feast of the Holy Innocents. Thus, it has always been. Even as we celebrate the birth of our Savior, we mourn the loss of those who were called home before their time.